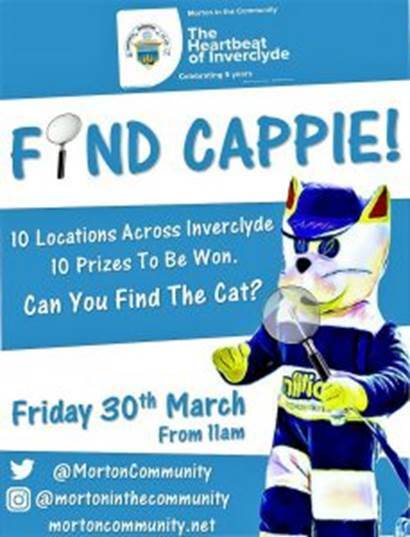 Club mascot Cappie the Cat will be spreading the cheer across Inverclyde this Friday as part of Morton in the Community’s fifth birthday celebrations. The Morton moggie will be taking part in a hilarious hunt which supporters and Inverclyde residents alike are encouraged to track down his whereabouts in order to claim some Ton-tastic prizes. 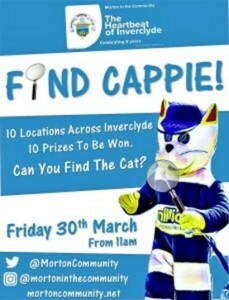 Cappie will be appearing at famous landmarks across Greenock, Gourock, and Port Glasgow from 11am, with clues as to his top-secret locations posted on Morton in the Community social media. The first person to find our crafty feline at each of his 10 pitstops will win a reward, amongst which is a parent and child ticket for this Saturday’s massive Ladbrokes Championship fixture against Dundee United. Keep your eyes on Twitter and Instagram for hints and pointers over the course of a fun-filled afternoon. © 2019 Greenock Morton Community Trust.